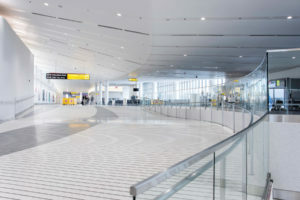 The Baltimore-Washington International (BWI) Airport multiple-phased contract required the construction of a new eight-lane passenger security screening checkpoint and airside passenger connector between Concourses D & E. All construction took place in an active airport environment. Underground power and telecom utilities throughout the tarmac area. Installation of new manhole and interception of airport’s 15kV loop to service new switchgear. Rigging, removal, repair and reinstallation of 75’ High Mast Light Poles on airport tarmac. New Main-Tie-Main electrical substation and electrical distribution. 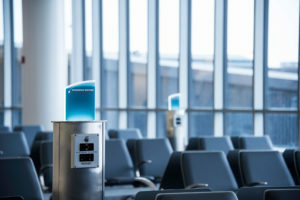 New UPS system for critical airport electrical loads. New fiber telecommunications backbone and infrastructure. New security backbone and infrastructure. Build out of new switchgear rooms, electrical rooms, telecommunications rooms and security rooms. Relocation of critical generator and all associated controls and monitoring. New busway run throughout the airport and over active customer pick-up/drop-off travel lanes. Installation of Wi-Fi system and paging system throughout new customer concourse. Installation of all lighting and controls, including flight observation decks, children’s play area, art walls and all administrative and public areas. New lightning protection system and snow melt system on roof. Coordination with and connection of baggage handling systems. Connection of 400Hz systems at passenger boarding bridges (PBB). Connection of moving walkways and elevators. Coordination of work around active runways and flight schedules.